A cat stands on one leg in imitation of a holy man while plump mice gather around. A family of elephants, with several calves in tow, approaches a river to drink. Half human-half snake figures slither up a crevice. Holy men stand on one foot while gazing into the sun. All these and more—including over one hundred depictions of humans, deities, spirits and animals—populate a massive relief sculpture, often called The Great Relief, near the coast in Mahabalipuram (also known as Mamallapuram), in southeast India. 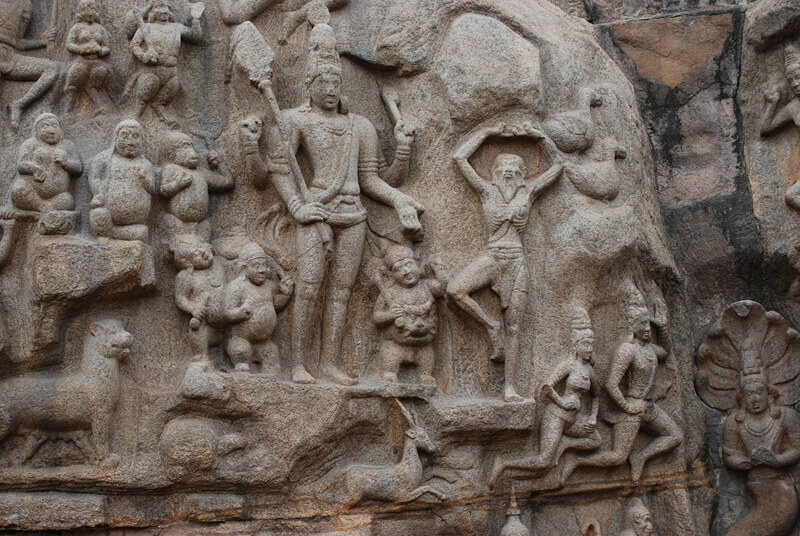 This particular relief is the most well-known of the monuments at Mahabalipuram that were carved from massive granite boulders naturally scattered throughout the region (there are over one hundred of these in situ carvings). This carving is one of the largest relief sculptures in the world, measuring 96 x 43 feet (29 m x 13 m meters), covering most of the faces of two adjoining boulders, with a large cleft in the center. This enigmatic artwork was created during the Pallava Dynasty (3rd-9th centuries, C.E.). Despite its long history of at least 1,200 years and plenty of scholarly attention, experts remain uncertain about its precise subject matter. It has been variously interpreted as a visual narrative of the “Descent of the Ganges,” “Arjuna’s Penance,” or other stories from the vast Hindu tradition. The origins and chronology of the Pallava rulers are ambiguous, but they seemed to have come from the north and taken advantage of a power vacuum in southeast India during the third or fourth centuries C.E. They ruled from the nearby capital at Kanchipuram while utilizing Mahabalipuram as a port city and for religious monuments and rituals. Pallava rule peaked in the seventh and eighth centuries C.E. During this time, the ruler Narasimhavarman I commissioned the monuments at Mahabalipuram. He was a devout Hindu as well as a lover of the arts. The Descent of the Ganges? The “Descent of the Ganges” is a well-loved Hindu story about the origins and religious significance of the sacred Ganges river. The story tells how the gods allowed the Ganges to descend from the heavens to reward a sage named Bhagiratha, who had practiced many years of spiritual devotion. The water from the river was meant to purify the ashes of Bhagiratha’s deceased ancestors while providing life-giving water to all creatures, great and small. To prevent the force of the cascade from destroying the earth, Lord Shiva (one of the primary deities of Hinduism) manifested under its fall and allowed the water to get caught in his long, matted hair so that it trickled out in gentle tributaries. On the Mahabalipuram relief, Shiva is depicted as one of the largest figures along with an ascetic (a holy man in a yoga pose). We know that this is Shiva because he is shown with the common attributes of the god: four arms, a crown of hair piled atop his head and holding his favored symbol, the trident. Nagas are snake deities that embody the qualities of fertility and prosperity and act as protectors of bodies of water. Scholars believe that a concave depression in the top of the boulder collected water which was then sent down the central cleft in imitation of the falling Ganges. This may have been done especially frequently during the wet monsoon season, serving as a visual indication of the divine authority of the Pallava kings as they recreated this important religious story for onlookers and dignitaries. The Pallavas controlled the Kaveri, a local river and a source of their political strength in the region. It is likely that the rulers wanted to symbolically connect the Kaveri and the Ganges to remind viewers of both their earthly and divine power. A second interpretation focuses not on the Ganges, but on the devotion of the archer Arjuna, hero of the epic Mahabharata. The conflicts between the cousins of Arjuna (the Kauravas) and his brothers (the Pandavas) are legendary and form the focal point of this grand tale. 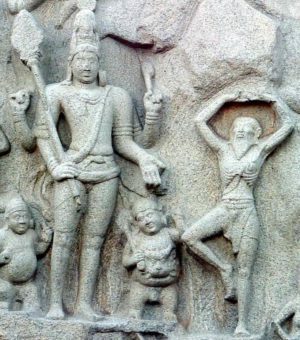 If this interpretation is correct, part of the scene at Mahabalipuram may depict the famed warrior Arjuna beseeching the god Shiva to provide him with his powerful weapon in aid against his enemies. Arjuna may be one (or all) of the figures depicted performing yogic devotion. In the detail here, a four-armed Shiva appears to be presenting a small figure with a fearsome face on his belly to the holy man who may be Arjuna and who stands on one leg. This small figure may be a personification of pashupatastra, Shiva’s most fearsome weapon. The protagonists of both interpretations—Arjuna and Bhagiratha—are heroic individuals who, through their penance, have a special relationship to the gods. Arjuna and Bhagiratha were protectors of their families, clans, and the earth. The relief may express the idea that the Pallava rulers, through their special connection to gods, were protectors of their lands and people. The Joyful Element: Something for Everyone? The Great Relief is complex and it is likely that very few people grasped all of its layers of meaning. The casual viewer may have been drawn to the amusing elements of the Great Relief. Perhaps the best-known detail in this vein is the cat who acts like a holy man (standing on one leg!) surrounded by unsuspecting mice who will soon become his dinner. Charming elephants and their playful calves also lumber into the scene. But the elephants may also have additional significance—they may symbolize the protective capacity of the Pallava rulers over their people, since in the real world elephants almost always have just a single calf, and here we see at least seven. Punctuating the entire relief are a multitude of fantastic beasts, hybrid figures, and airborne deities. These extraordinary representations allow anyone to enjoy the relief even with little or no understanding of its complex mythology. These delightful scenes may have provided an “entry point” for viewers in the seventh century just as they do today, while more learned viewers would recognize deeper layers of meaning. Conflicting Stories or Multiple Meanings? Hinduism is populated with a vast number of gods and goddesses (along with their manifestations or avatars), as well as saints, demons, demigods, and beasts. It is a belief system that is often multi-layered and seemingly contradictory; the fortunes of gods and humans alike shift frequently while time and space and good and evil are fluid and ever-changing. In light of this unstructured quality of Hinduism (as compared to many other religions), the contemporary non-Hindu viewer of these monuments shouldn’t be too concerned that there is some ambiguity in the Great Relief. In an excellent article about the relief, the scholar Padma Kaimal emphasizes its “playful ambiguity” and remarks that “the absence of … such unequivocal signs creates space for the coexistence and interaction of multiple voices and therefore meanings.” She draws a parallel between the visual art and the language of the Pallava court—both incorporate puns and multilayered meanings. The art historian Michael Rabe similarly contends that the work may have been intentionally created as “a deliberate conundrum,” allowing the viewer to witness intermingled and “repeated occasions when Shiva’s favor has been bestowed.” The Pallava rulers glorified Shiva as the most significant deity, so it is logical that the focus here would be on stories connected to that god. Whatever the correct interpretations are, this sculpture appears to incorporate religious storytelling, allusions to Pallava power and protection, and joyful scenes of animals, people, and deities. Some elements of the relief would appeal to educated members of the court and the priestly class, others to visiting dignitaries, and still others to the average citizen. 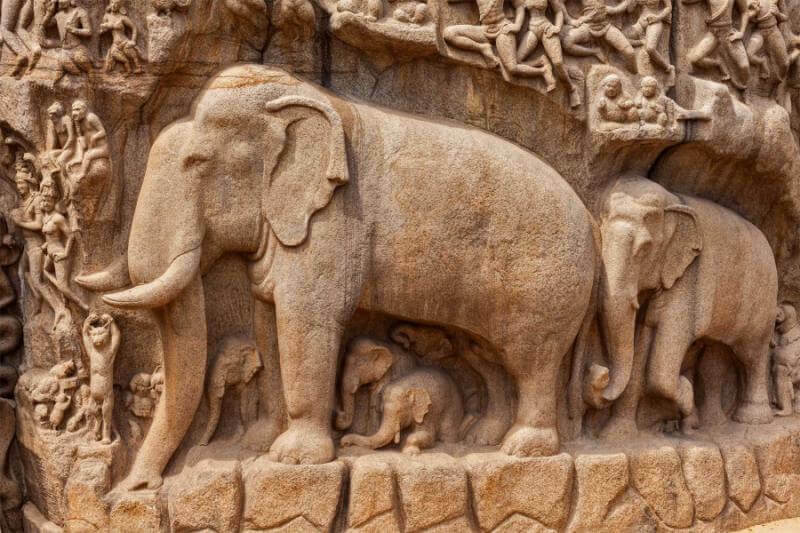 Today, as in the preceding fourteen centuries, the Great Relief at Mahabalipuram does not fail to impress as it draws visitors from across India and the rest of the world. Even when not fully understood, the Great Relief contains something for everyone.